MIAMI — I arrived late for Friday’s production of “The Colored Museum,” and I really wanted to kick myself. I plan to see it again just to catch the opening scene because based on everything else I saw, you really don’t want to miss a second of this riveting, thought-provoking, extremely welldone play. Nothing against other local plays with well-intentioned, but below average acting talent, but the casting director for “The Colored Museum” got it right. Every actor is talented enough to hold their own in major plays, on Broadway or on the big screen. They’re that good. This is Jamel Booth’s first time directing a play and trust me when I say, you will hear his name in the future. A lot. I would love to have been a “fly on the wall” during rehearsals just to see him in action. I get the sense he helped these phenomenal actors take their skills to even higher levels. The Michael Krop high school grad brings a sure-hand typically wielded by directors with far more experience. 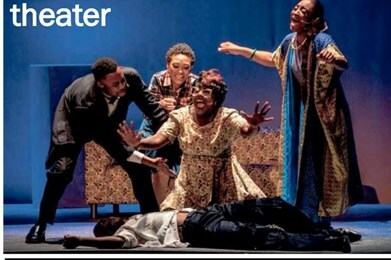 The play, which originally premiered in 1986, was written by George C. Wolfe, director of “Bring in ‘da Noise/Bring in ‘da Funk” and “Shuffle Along.” Set in a fictional museum with 11 exhibits performed as monologues, the play is a provocative satire that “both celebrates and mocks African-American identity and stereotypes.” It has been staged in New Jersey, New York, and London, most famously at the Royal Court Theater – and has been recognized for its poignant subject matter and in-depth exploration of the African-American theatrical and cultural past. While serving as a musical theater instructor at the AHCAC’s Summer Arts Conservatory, Booth was selected by Tarell McCraney, cocreator of the Oscar-winning film “Moonlight” and AHCAC alumnus, to work with his brainchild mentorship group Youth Artist Leadership Summer (YALS) program. Booth now serves as the magnet theatre teacher at Michael Krop Senior High School in Miami. For more information or to purchase tickets, call 305-638-6771 during business hours Monday through Friday, 8:30 a.m. – 6:00 p.m. or visit www.ahcacmiami.org.